Bright self-catering apartment with 1 bedroom, 1 living room with a dining area and a bathroom, suitable for up to four guests – ideal for visitors who want easy access to the best of Cracow! Stay within a 5-minute walk of Cracow’s all major tourist sites such as Main Market Square and the old Jewish quarter - Kazimierz! The apartment is located in an old street connecting Krakow’s UNESCO-listed Old Town with the old Jewish quarter! The parquet floor apartment features one bedroom with a double bed and a 20 cm-thick mattress (can be converted into two single beds), one living room with a comfortable double sofa bed , along with a fully-equipped kitchen and a bathroom. We do our best to maintain our apartment immaculately clean so our beds are covered with hygienic mattress protectors, our white towels and bed linen are washed in 90°C and pillows are anti-allergic. Located on 3rd floor the apartment faces away from the street into an interior courtyard, so despite the central location you can enjoy peaceful sleep. 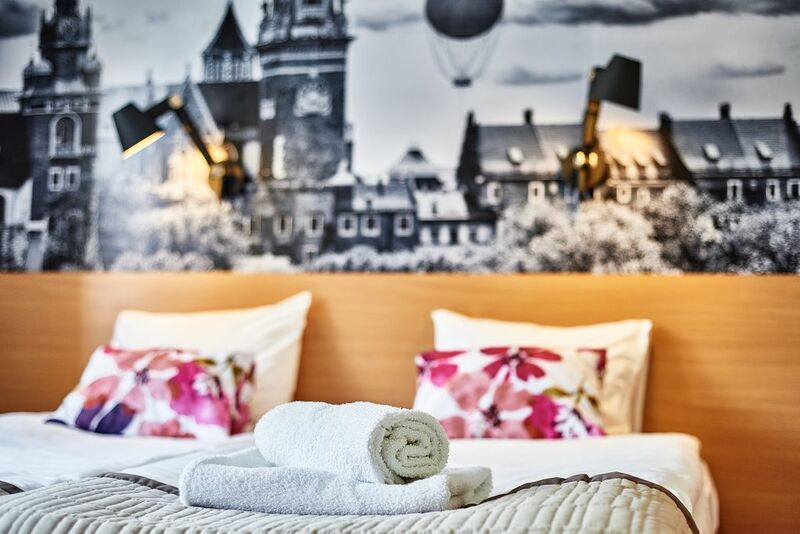 We hope that our comfortably furnished, bright interiors will help you feel at home and relax after your busy sightseeing day in Krakow. There is a variety of restaurants and cafés in the surrounding area , Old Town and Kazimierz offer a great choice for travellers interested in history, art, food and entertainment. Flat tv, iron , electric kettle, refrigerator, induction cooker, hair dryer, bed linen, towels and soap and toilet paper provided. -	Main Market Square (City Center) – 650 meters, walking distance: 5 minutes. -	Kazimierz (Old Jewish District) - 600 meters, walking distance: 5 minutes. -	Wawel, Royal Castle – 1100 meters, walking distance:13 minutes or 3 tram stops. -	Main Train Station – 1100 meters, walking distance: 13 minutes or 2 tram stops. You are in the center but windows go on the backyard so you can take a rest after a busy day in the city. We can provide you a garage. Our guests can leave their car in our garage (in the backyard of the building). Place available for 1 car. We provide it to our guests for an additional price of 7eur/day. You will find some books in English and Italian. We just loved everything about this apartment. It was very clean and nicely appointed. The kitchen and bathroom were recently updated. The sunny kitchen has table where four can sit comfortably. There was a small balcony outside the bedroom which we did not use as we were out and about most of the day. The location is terrific; it is only a 5 minute walk to the main square, a 5-10 minute walk to Kazimierz and a 25-minute walk (or tram ride) to the main train station. There are a few trams right outside the building. Even though the apartment is on a "busy" street, the apartment is in the back of the building and the windows (also new) are soundproof so noise was not an issue at all. Kasia responds to emails very quickly (within the hour). If any friends are visiting Krakow, I would DEFINITELY have them get in touch with Kasia. The apartment is suitable for short-term stays as well as longer-term stays (business, etc.). The neighborhood (and all of Krakow for that matter) is very safe. Don't think twice. You will not be disappointed. It's a gem. Enjoy! The apartment was very clean and bright and comfortable. We enjoyed the balcony as well. Very quiet for sleeping. Very well supplied in the kitchen and bathroom. Only needed to go get a few groceries which is close by. The location of the property is great. I highly recommend this property. Kasia is very helpful. We enjoyed our stay. This apartment is centrally located and within easy walking distance to all the major areas of interest. Easy access from the train/bus station via tram. Apartment was comfortable and quiet. Requires "Homeit" app for complex access. Be sure to download this app before you begin your trip.